This series of photographs with associated memories of life around an operational fire station in the 1950s is shared by Roger Brailsford who, as a child, lived at one of the Fire Service houses at the top of Stoney Street where his father, William (Bill) Brailsford, served as a fireman. Bill Brailsford, originally from the St Anne's Well Road area of Nottingham, joined the fire brigade in Nottingham, at its headquarters on Shakespeare Street, in around 1948 after 10 years service in the army with the Leicester Regiment. Around 1952, he was posted to the Beeston Fire Station with wife Joan and their son Roger. The family lived at 49 Stoney Street, one of the Fire Service houses that stood either side of the fire station Watch House that can be seen in the next photograph. Other houses were occupied by firemen and their families, including Colin Shakespeare, Maurice Hind and Ernest Chadney. 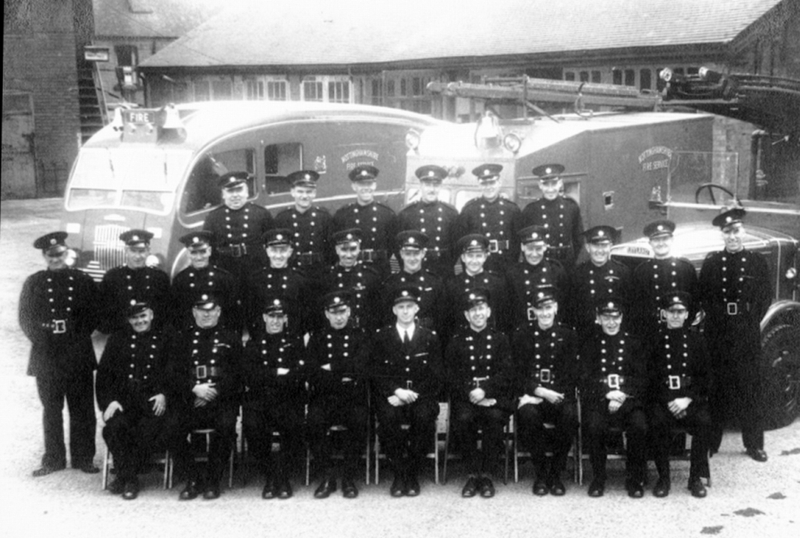 The men of Beeston Fire Brigade - both full-time and retained - probably on the occasion of the arrival of the new Dennis F15 appliance in around 1952/3, an Austin K2 National Fire Service pattern and a Leyland Braidwood pattern (open cab) pump escape. Fireman William (Bill) Brailsford is in the middle row, fifth from the left. Fireman Maurice Hind is front row, second from right. Fireman Len Gaynor may be second from left in front row. Seated on the left end of the front row is believed to be Alf Stevenson, a retained firemen who also worked as a window cleaner. Gill Grattage (née Tew) has pointed out her father, William (Bill) Tew, standing on the extreme right of the middle row. Gill has also named Eric Shepherd, who lived on Abbey Road, 2nd left on the back row. Bill Tew was a retained fireman who worked at Raleigh for his full-time job. Gill recalls that their home on Windsor Street was fitted with a bell at the top of the stairs which rang when Bill was called out. It was tested every morning at 8am with six short bursts. The photograph is taken in the Stoney Street yard outside the appliance room. The hose tower would be just out of view to the right of the picture. 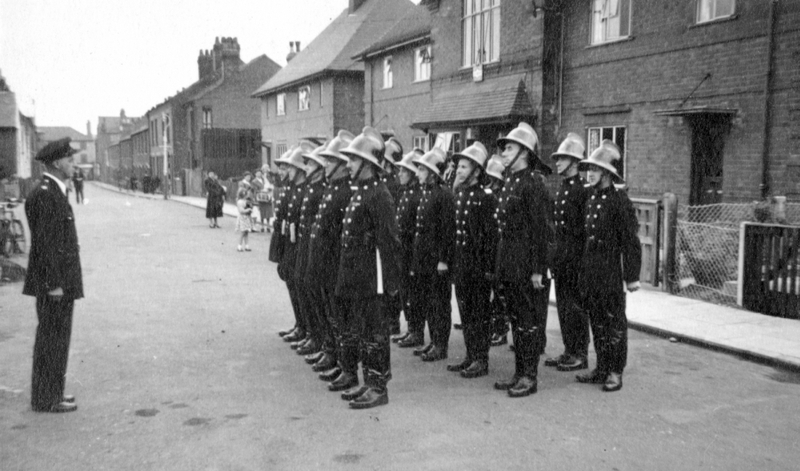 The fire station occupied two sides of the yard at the top of Stoney Street with a Beeston & Stapleford Urban District Council depot on the other two sides. The buildings on to the left are part of that Council depot with stair access to upper floors. All of this area is now the site of Sainsburys and its car parks. Firemen parade on the corner of Stoney Street and what they called "Burma Road" (a gated extension to Cross Street) in around 1953-4. 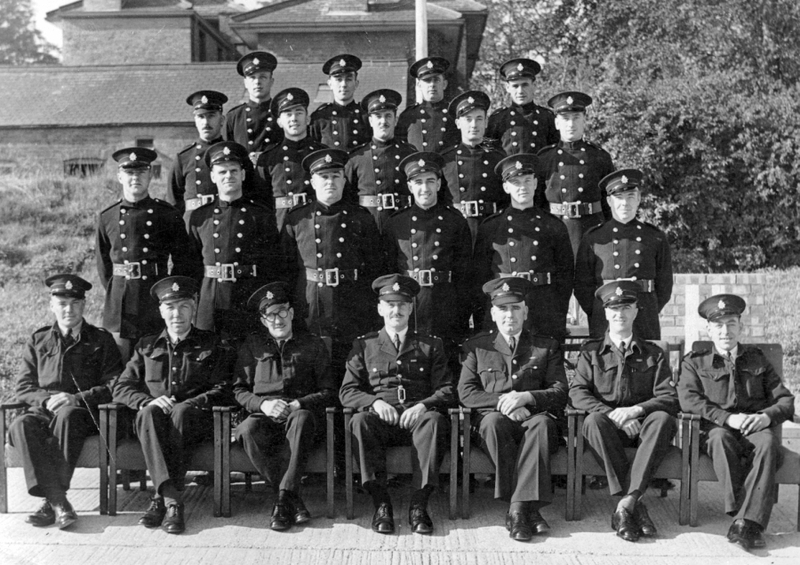 Fireman William (Bill) Brailsford is closest to the camera in the front row of the squad. The Fire Station watch room is the building with the large window in the upper storey. On either side are houses occupied by firemen with each house fitted with an electric bell that activated in time with a fire call. There is an interesting view down Stoney Street towards High Road in the distance. The last of the fire service houses was 49 Stoney Street with a corrugated iron shed beyond that was part of Len Gaynor's business, The joiner's workshop of George Wood & Son (Builders) stood opposite the Gaynor premises. The small gate behind the squad provided access to a petrol store. The same squad on parade, taken from the opposite angle from Stoney Street. The oval shaped building behind the squad is the Tarren Hut. The road to the left, alongside the Tarren Hut, known by the firemen as the "Burma Road", provided access to the boiler room, Fire Service kitchen/dining area and hose repair shops and, through a steel gate, to Villa Street and Cross Street. Stoney Street continued beyond the hut to a sand pit which extended almost to the backs of the properties on the south side of Abbey Road. It was used by the Beeston Boiler Company to extract sand used in the casting process. The used sand was returned to the area of the pit. Some of the resulting piles of blacked sand can be seen in the photograph, behind the Anglo Scotian mill buildings shown in the distance. 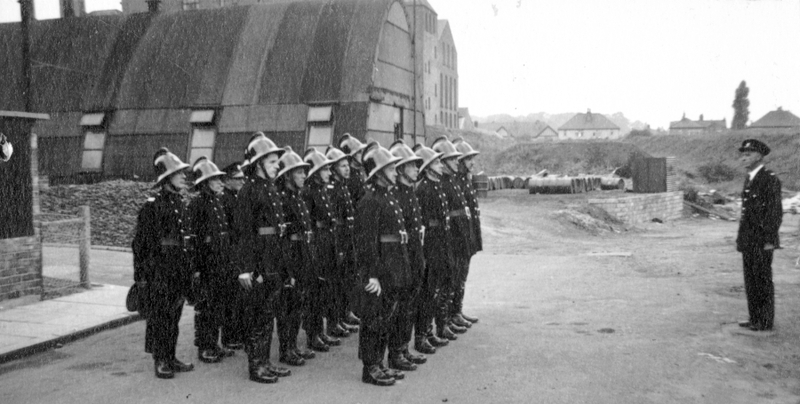 The Auxiliary Fire Service was formed as part of Civil Defence cover and a response to the Cold War threat of nuclear attack in the years following World War 2, and it also provided support to the regular Fire Service when required. By around 1956, it is thought that Beeston had a "Green Goddess" appliance, that was housed in a separate shed situated behind, and parallel to the Tarren Hut and that Auxiliary Fire Service staff assembled there for training. The shed was distinctive because it was a metal frame building clad in shiny bright corrugated iron that contrasted markedly with the much older buildings in the area. The "Green Goddess" Bedfords came in both 2 and 4-wheel drive models, with Beeston's probably a 4WD model. Green Goddesses were mothballed, retained for emergency use at the end of the 1960s and were used subsequently by military personnel to provide cover during firefighters' strikes. This is a view, apparently taken from outside 49 Stoney Street (where the Brailsford family then lived) and shows an exercise in progress, to deploy a wheeled escape ladder to the hose tower. The tower, used to dry hoses, was also used for escape and rescue exercises including the use of short hook ladders enabling firemen to climb between floors on the external face of the building. The house in the foreground is to believed to have been one provided for the supervisor of the Council depot seen directly ahead, beyond the fire station appliance room and tower. To the right of the house is a dividing wall between the Council/Fire Station yard and Woods joinery shop on the right. There was an extensive air raid shelter opposite the Tarren Hut, under ground, that the firemen at Beeston (and probably some of the surrounding stations) used for training with breathing apparatus (mostly Siebe Gorman Proto sets). A dummy - dressed as a fireman - would be placed in the shelter, a smoke device would be activated and the firemen would then be expected to "rescue" the dummy. That poor old dummy was also used for ladder rescue practices ! 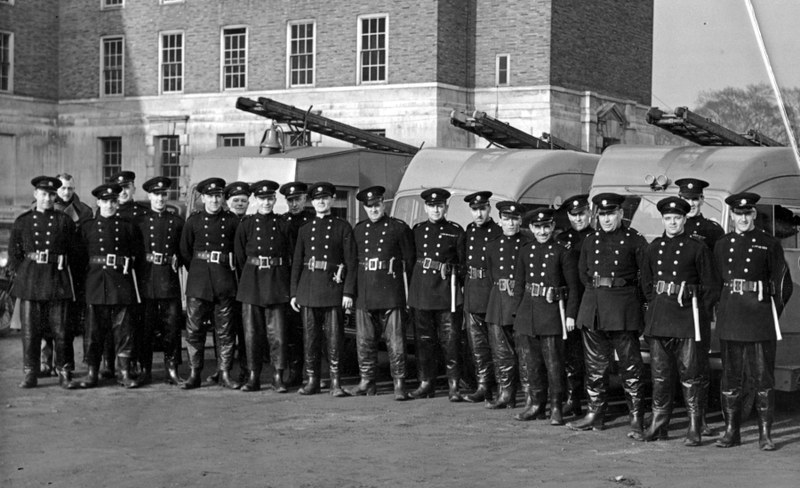 The Nottinghamshire Fire Service contingent sent to help in the East Coast floods of February 1953. The photograph appears to be taken at County Hall, near Trent Bridge. Fireman William (Bill) Brailsford is eighth from the right. The names of the others, who would include members of various Nottinghamshire brigades, are not presently known. This photograph is believed to show a group of firemen who attended a Fire Service breathing apparatus training course in Nottingham in about 1947. Fireman William Brailsford is on the far left of the middle row of standing men (with the moustache). The identity of other men is not known. This identity of the group is based on its position in Bill Brailsford's photograph album alongside a Certificate of Competence for use of Breathing Apparatus (Proto, Salvus and Firefox), with respect to "Fireman 140024 Brailsford. W., attached to No8 Area (Nottingham)". The certificate was signed, on 15 March 1947, by AR Bacon (Examining Officer) and A. Rushton (OIC Station). However, it is unlikely that the event was actually held on that date as it coincides with a time in the middle of one of the worst winters known in the UK. Although there was a thaw in the middle of February, this brought severe flooding, including in the Beeston and Nottingham area, which would have occupied the Fire Service in pumping and rescue operations. In about 1957, the Brailsford family moved to Farm Road Chilwell, In 1958, Leading Fireman William Brailsford was promoted to the rank of Sub-Office and was working at Fire Service Headquarters, originally at County Hall but later relocated to Rolleston Drive in Arnold. 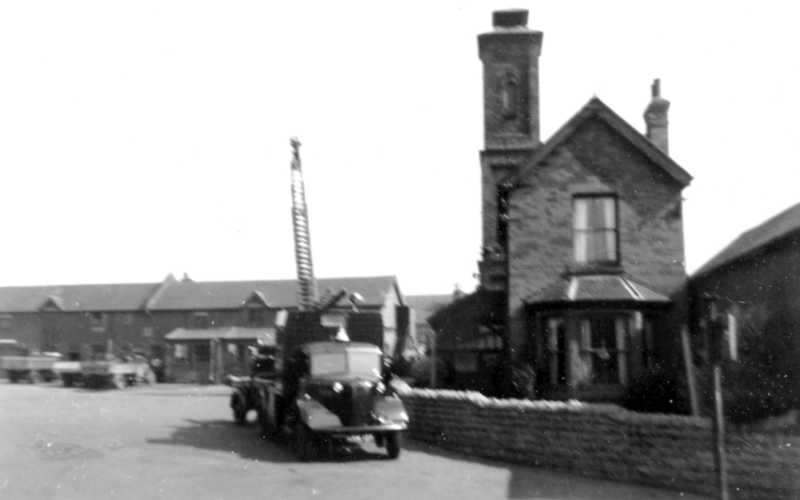 The Beeston fire station was relocated of the fire station to new premises in Station Street in March 1965. Roger Brailsford now lives in Australia. Let us know if you recognise any of persons shown or have memories or comments to share.